I wrote last year for my Beauty Guru column on Yahoo Shine. The focus was on office holiday party makeup. I chose to feature two looks, one for the formal office party and one for the casual office party (you know the one at the local bar after work). 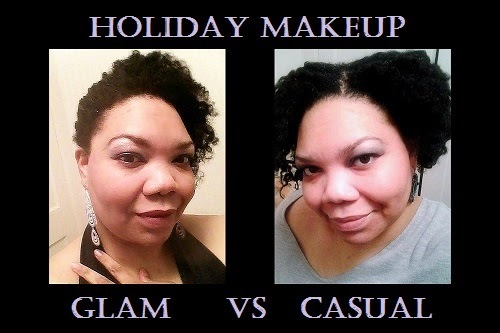 However, both looks are not just for an office party they can be used for any formal or casual holiday party you are attending this season. When I think of glam makeup for a formal holiday party, I think of bold makeup that has a touch of shimmer to it. The base should be as close to flawless as you can get without looking like you caked on foundation or concealer. Lips are dark within the deep red and wine shades. Cheeks also fall within the range of deep rose red to wine. Eyes should sparkle so a shimmery eyeshadow is my favorite choice. I recommend finishing off the face with a powder that either has a soft shimmer to it or creates a soft glow for your face. Lightly smooth eyeshadow primer on eyelids. Line upper lash line with a dark liner -- I used e.l.f Essentials Liquid Liner in Plum -- and wing the liner out at the corners of your eyes. Sweep a metallic eyeshadow across your lid. I used two colors -- e.l.f Studio Long-Lasting Lustrous Eyeshadow in Confetti and Festivity. I smoothed the Confetti shade (silvery white shade) over my lid and brow bone first. Next, I applied Festivity (metallic plum/eggplant) to my crease and blended it upward and outward toward the outer edge of my eye. Blend eyeshadow to soften any harsh lines. This video will show you how. Apply one to two coats of mascara. Sweep a red or wine-hued blush across cheeks. One sweep of color will do and then use your blush brush to blend and soften by working it in a circular motion over your cheeks. If your lips feel a bit dry, apply a little lip balm on them. Not too much, just enough so they won't be dry. Fill in lips with your lip liner. I used a darker plum liner – Avon Ultra Luxury Lip Liner in Deep Plum -- to deepen my lipstick. Apply lip color (Avon Ultra Color Lipstick in Rich Ruby). Blot lips and reapply color. Layering lip color helps to make it last longer. Lightly dust face with powder to set and soften. I opted for a soft glow and used e.l.f Studio High Definition Powder. Most casual holiday office parties happen after work either on site or at a local bar. You will have to update the makeup you wore to work. The easiest way to change your makeup from work to holiday party is to switch up your lip color. Go for bolder, festive shades like a satiny red or shimmery fuchsia. Personally, I like to play up my eyes for evenings. Since it is casual, your eye makeup color choices are limitless. For the look I created, I chose to play up the eyes. I opted for a denim eyeshadow duo (Maybelline ExpertWear Eyeshadow in Grey Matters) and paired it with a subtle cat eye. Since you are only updating your makeup, the following steps are all about the eyes and refreshing the face at the end. Sweep the lighter shade of shadow in your duo, across entire lid and over brow bone. Apply darker shadow starting at the inner corner and into the crease. Take a clean brush and blend the shadow on your crease and upward. Line upper lash line with a black or navy liner and wing it out at the outer corners. Line lower lash line and wing it upward to meet the winged corner of your top line. Apply one coat of mascara. Blot away any shine on face with blotting papers. OR Use this tip I learned from one my Beauty Guru readers and use a dark napkin like the ones you find at Dunkin Donuts to blot the oil. Sweep face powder over face to help control any shine and to set your face. The looks I created ideally work for someone with my coloring. However, each look is adaptable. Therefore, change the colors to ones that best flatter your skin tone. Is your holiday party casual or formal this year? What makeup colors will you be wearing?